GearBuyer has a large selection of Slumberjack Sleeping Bags in different shapes, insulation, and sizes. Stay warm and comfortable with GearBuyer's selection of Slumberjack Sleeping Bags. You may be interested in sleeping bags from other popular brands like Coleman Sleeping Bags, Kelty Sleeping Bags, Marmot Sleeping Bags, and Big Agnes Sleeping Bags. Slumberjack Latitude 40 Degree Sleeping Bag Long - Slumberjack Latitude 40F Synthetic Sleeping Bag - Long Size Features. Slumberjack Latitude 40F Synthetic Sleeping Bag. 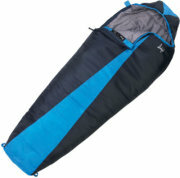 The Slumberjack Latitude 40F Synthetic Sleeping Bag is a great companion for those outdoor treks! Your bag comes equipped with a two layer, off-set construction which keeps you warm and insulated from the cold while you snooze. It has a flip over hood which allows you to adjust the hood depending on the weather outside. 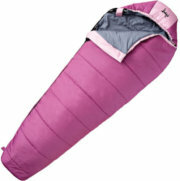 Slumberjack Big Scout Sleeping Bag - Slumberjack Girl Scout 30F Sleeping Bag for Girls Features. Slumberjack Girl Scout 30F Sleeping Bag for Girls. The Slumberjack Girl Scout 30F Sleeping Bag for Girls is sure to make the heart of any girl camper sing with joy. A flip-over hood gives you the option of turning the hood inside out so that you can use it contoured or flat, as you prefer. With a two-layer, off-set construction and a differential cut, cold spots are effectively eliminated and you feel warm and cozy through the night. Slumberjack Latitude 20 Degree Sleeping Bag Regular - Slumberjack understands the importance of quality recreation and family time. The Women's Latitude, from the Slumberjack Camping collection, is loaded with features like proprietary Slumberloft insulation, water-repellent shells and more, all to help make your nights outdoors memorable, for all the right reasons. Latitude bags are designed to retain warmth by fitting to the contours of your body yet are spacious enough to enable maximum comfort while sleeping. Slumberjack Esplanade Oversized -20 Degree Hooded Sleeping Bag Regular - Slumberjack understands the importance of quality recreation and family time. The Esplanade, from the Slumberjack Camping collection, is loaded with features like proprietary Slumberloft insulation, water-repellent shells and more, all to help make your nights outdoors memorable, for all the right reasons. Esplanade series bags are oversized for those who are seeking extra room, and don't mind carrying a little extra weight on the trail. Slumberjack Forest 0F Sleeping Bag - If value is your game, look no further than the Slumberjack Forest 0 Degree Rectangular sleeping bag. Constructed with extra Slumberloft insulation for warmth, and durably constructed to last, the Forest 0 Degree is a great choice for your cold-weather adventures. Durable construction ensures stable insulation over time. Polyester taffeta shell and lining. Slumberloft synthetic insulation. Zip-together feature allows two same-size rectangular bags to be joined, making a double-wide bag for two. Slumberjack Family Camper Self-Inflating Sleeping Pad - Slumberjack Family Camper Sleeping Pad offers the support, comfort and durability needed for various outdoor sleeping environments. Fully bonded construction. Abrasion-resistant polyester (DWR coated) top and bottom. Standard PU open cell foam for efficient insulation and durability. Self-inflating design. High intake air valve..
Slumberjack Latitude 0 Degree Sleeping Bag Regular - Slumberjack understands the importance of quality recreation and family time. The Latitude, from the Slumberjack Camping collection, is loaded with features like proprietary Slumberloft insulation, water-repellent shells and more, all to help make your nights outdoors memorable, for all the right reasons. Latitude bags are designed to retain warmth by fitting to the contours of your body yet are spacious enough to enable maximum comfort while sleeping. Slumberjack Latitude Sleeping Bags - Lightweight and versatile, these bags feature two-layer, offset construction and differential cuts for cold-spot prevention. Draft tube along anti-snag zipper keeps cold air out. Heat-trapping draft collar protects neck and shoulders. Flip-over hood gives you the option of a flat or contoured hood. Trapezoidal footbox offers extra foot space for a comfortable night’s sleep. Tear-resistant, polyester diamond ripstop shell with polyester taffeta liner. Included stuff sack. Imported..
Slumberjack Timberjack Sleeping Bags - The robust Slumberjack Timberjack series of sleeping bags are feature rich, and are designed for maximum comfort and warmth. For chilly nights, the Slumberjack 20 Degree Timberjack Rectangular is a great choice. With a soft-touch lining and pillow pocket, you're assured a cozy night's sleep, and the amazing value will assure you pleasant dreams. Polyester ripstop shell, soft-touch polyester lining. Two-layer offset quilt construction and differential cut prevents cold spots. Slumberjack Bonnie & Clyde 30/40 Degree Double Sleeping Bag - Slumberjack Bonnie & Clyde 40F / 30F Double Sleeping Bag Features. What's in the box: Bonnie & Clyde 40F / 30F double sleeping bag with two flannel pillows and carry duffleSlumberjack Bonnie and Clyde 40F / 30F Double Sleeping Bag. The Slumberjack Bonnie and Clyde 40F / 30F Double Sleeping Bag is a lovely versatile choice to invest in, as you head outdoors for a vacation with your loved one. Slumberjack Forest 20F Sleeping Bag - If value is your game, look no further than the Slumberjack Forest 20 Degree Rectangular sleeping bag. Constructed with extra Slumberloft insulation for warmth, and durably constructed to last, the Forest 20 Degree is a great choice for your spring-thru-fall adventures. Great for campsites and cabins. Polyester taffeta shell and lining. Durable construction ensures stable insulation over time. Slumberloft synthetic insulation. Zip-together feature allows two same-size rectangular bags to be joined, making a double-wide bag for two. Slumberjack Micro Fleece Rectangular Sleeping Bag Liner or Blanket - For those nights when there is an extra bite in the air, the Slumberjack Micro Fleece Rectangular Liner is the perfect accompaniment to a Slumberjack sleeping bag. The added warmth can mean the difference between a restful and arduous night. Adds warmth and keeps your bag clean. Full-length, two-way zipper. Matching stuff sack..
Slumberjack Timber Jill 20 Degree Rectangular Sleeping Bag - The robust Slumberjack Timberjack series of sleeping bags are feature rich, and are designed for maximum comfort and warmth. Her choice for chilly nights, is the Slumberjack Women's Timber Jill 20 Degree Rectangular. With a soft-touch lining and pillow pocket, you're assured a cozy night's sleep, and the amazing value will assure you pleasant dreams. Layered offset quilt construction prevents cold spots. Polyester ripstop shell, soft-touch polyester lining. Slumberjack Timberjack 40 Degree Rectangular Sleeping Bag - The robust Slumberjack Timberjack series of sleeping bags are feature rich, and are designed for maximum comfort and warmth. For summer excursions, the Slumberjack 40 Degree TimberJack Rectangular is a great choice. With a soft-touch lining and pillow pocket, you're assured a cozy night's sleep, and the amazing value will assure you pleasant dreams. Two-layer offset quilt construction and differential cut prevents cold spots. Polyester ripstop shell, soft-touch polyester lining. Slumberjack Latitude 20 Degree Sleeping Bag Long - Slumberjack understands the importance of quality recreation and family time. The Latitude, from the Slumberjack Camping collection, is loaded with features like proprietary Slumberloft insulation, water-repellent shells and more, all to help make your nights outdoors memorable, for all the right reasons. Latitude bags are designed to retain warmth by fitting to the contours of your body yet are spacious enough to enable maximum comfort while sleeping. Slumberjack Esplanade Oversized 0 Degree Hooded Sleeping Bag Regular - Slumberjack understands the importance of quality recreation and family time. The Esplanade, from the Slumberjack Camping collection, is loaded with features like proprietary Slumberloft insulation, water-repellent shells and more, all to help make your nights outdoors memorable, for all the right reasons. Esplanade series bags are oversized for those who are seeking extra room, and don't mind carrying a little extra weight on the trail. Slumberjack Jenny 20F Sleeping Bag - Stuffed full of comfortable Slumberloft insulation, women will love the Slumberjack Jenny Women's 20 Degree Rectangular sleeping bag for 3-seaon camping. Constructed with extra Slumberloft insulation for warmth, and durably constructed to last, the Jenny 20 Degree is a great choice for your spring-thru-fall adventures. Great for campsites and cabins. Polyester taffeta shell and lining. Durable construction ensures stable insulation over time. Slumberloft synthetic insulation. Zip-together feature allows two same-size rectangular bags to be joined, making a double-wide bag for two. Slumberjack Timberjack 0 Degree Rectangular Sleeping Bag - The robust Slumberjack Timberjack series of sleeping bags are feature rich, and are designed for maximum comfort and warmth. Take the Slumberjack Timberjack 0 Degree Rectangular Bag along, for those frigid nights in camp. With a soft-touch lining and pillow pocket, you're assured a cozy night's sleep, and the amazing value will assure you pleasant dreams. Two-layer offset quilt construction and differential cut prevents cold spots. Polyester ripstop shell, soft-touch polyester lining. Slumberjack Big Timber Oversized 20 Degree Sleeping Bag - Rugged, dependable and comfortable. These three elements define the Slumberjack Women's Big Timber, from the Woodsman series of sleeping bags. With tough outer fabrics and soft flannel liners, these oversized sleeping bags guarantee rest for a full next day of adventure. Now the outdoorswoman has a Big Timber designed specifically for her. Two-layer, offset construction and differential cut prevents cold spots. Yarn-dyed 100% cotton flannel liner. Slumberjack Scout Sleeping Bag - Featuring heat-trapping SlumberLoft™ insulation and ground-level side seams, these lightweight bags offer exceptional warmth and comfort. Two-layer, offset construction prevents cold spots. Draft tube along anti-snag zipper keeps cold air out. Flip-over hood gives you the option of a flat or contoured hood. Chest pocket for holding valuables. Built-in pillow pocket keeps pillow in place while sleeping. Trapezoidal footbox offers extra space. Polyester Taffeta shell and liner. Stuff sack included. Slumberjack Go-N-Grow 30F Sleeping Bag and at SunnySports - Slumberjack Go-N-Grow 30F Sleeping Bag for Boys and Girls Features. 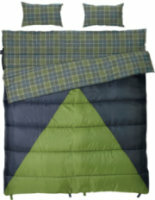 Slumberjack Go-N-Grow 30F Sleeping Bag for Boys and Girls. The Slumberjack Go-N-Grow 30F Sleeping Bag for Boys and Girls is the perfect choice of outdoor equipment for your children to use on their camping trips. Zips provided are all anti-snag which makes them convenient to use. Owing to a two-layer, off-set construction and a differential cut design, it effectively eliminates cold spots and keeps you warm and cozy. Slumberjack Latitude 0 Degree Sleeping Bag Long - Slumberjack understands the importance of quality recreation and family time. The Latitude, from the Slumberjack Camping collection, is loaded with features like proprietary Slumberloft insulation, water-repellent shells and more, all to help make your nights outdoors memorable, for all the right reasons. Latitude bags are designed to retain warmth by fitting to the contours of your body yet are spacious enough to enable maximum comfort while sleeping. Slumberjack Big Timber 0 - The Big Timber 0oF / -18oC bag is a rugged, dependable and comfortable sleeping bag guaranteed to give you a full night's rest for your next day's adventure. The cotton flannel lines gives the bag a plush feel and the two-layer construction prevents cold spots. Durable, heavy-duty shell materialTwo-layer, off-set construction and differential cut prevents cold spotsWarm and cozy cotton flannel linerZip together feature allows two same-sized rectangular bags to be zipped together for a double-wideAnti-snag zipper protectionThree compression straps for easy storing. Slumberjack Esplanade 0F Sleeping Bag - Built for the extremes of wintertime camping, this heavy-duty sleeping bag will keep you sleeping soundly through the worst bone-chilling nights. The Slumberjack Esplanade 0°F Sleeping Bag features dual-layer offset construction that maximizes heat retention by locking in warmth and sealing out the cold. An oversized side panel provides extra space so you can move around comfortably in the bag. The dual-layer hood can be flipped inside out to lay flat for extra ventilation or snugged tightly around your head for extra warmth.